Valley Irrigation provides new system for more precise chemigation and fertigation. Even more precision is now available for irrigators with Valley Irrigation's new Cruise Control for pivots, a development Valley says will do for irrigators what GPS did for auto steer on tractors. With Cruise Control, producers can program a center pivot irrigation rig with a Pro2 control panel to automatically adjust its speed, based on completing a defined number of degrees in a specific amount of time. This feature is aimed at allow more precise control of chemigation and fertigation through sprinklers to make sure a given amount of product is applied to a given amount of farm land -- with no overlaps or untreated "wedges" of the circle. Valley Irrigation's Pro2 control panel will come standard with Cruise Control from now on, and existing panels can be readily upgraded. Cruise Control will be standard on all Pro2 panels this spring, and existing Pro2 panels can readily be upgraded to host the feature. 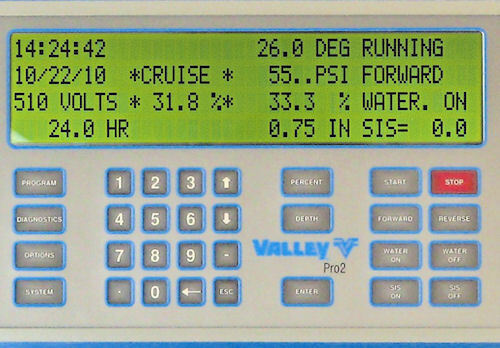 For more information on Cruise Control and the Pro2 panel, visit www.valleyirrigation.com.